With security breaches being mentioned in the news every week it’s more important than ever to make sure you have secure passwords. But what if you can’t remember them all? Are you writing them down on Post-It notes and sticking them to your monitor? Do you have your “super secret” passwords written on a piece of paper and taped to the bottom of your keyboard? Do you have a Word or Excel file on your computer with the name “Passwords”? If so, then you are a prime candidate for a password management solution from Cyclonis. Free! 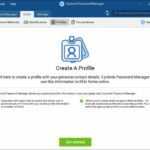 Yes, Cyclonis Password Manager is free to use! 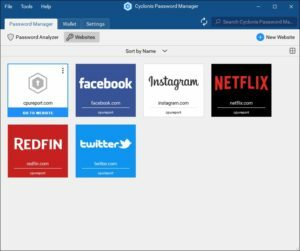 Next, visit Cyclonis to download their free password management software for Windows or Mac. Note that you must have a Windows 7 computer with Service Pack 1 installed. Mac users must have macOS 10.11 or better. For our review we are using Windows 10 installed on a virtual machine. 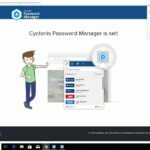 After the short installation process, Cyclonis Password Manager asked us to create a master password. The master password is what you will use to secure all of your other passwords so that you don’t have to remember them. This password should be one that you have never used anywhere else, is easy to remember, is easy to type, and is hard for anyone to guess including computers. However, we would recommend something much stronger. 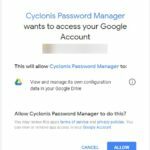 Cyclonis doesn’t store your master password on their servers but you can copy the data files to your Google Drive, iCloud, Dropbox, and OneDrive accounts so that you can access your passwords from anywhere. We’ll discuss that a little later in the review. If someone were able to download that file they would have unlimited access to try to crack your master password. While most online password checking tools will tell you that “Password!123” meets the requirements and will take 1.74 centuries to crack but, in reality, it would only take a couple microseconds to crack. So we would definitely suggest that you consider a much longer password or pass phrase. Random words or short sentences are a great way to create a pass phrase that you can easily remember and type. I really REALLY need to clean 0ut the garag3!! 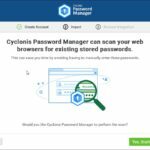 During the installation process Cyclonis will ask if you want to scan your browsers for passwords that you may have saved there and you definitely should. Passwords stored in your web browser are not secure unless you used a browser password which most people don’t. Plus, it’s a great way to quickly test some of your sites after installation is complete. It wasn’t clear if Cyclonis removed the stored browser passwords and turned off the browser password saving feature after they imported them because we didn’t have any passwords stored in our browser at the time. You will be given the option to integrate Cyclonis Password Manager with your preferred browsers. 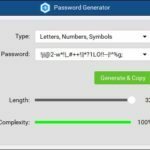 We highly recommend this as it will encourage you to use the product more often and get accustomed to creating meaningless, unmemorable passwords for all of your websites. The best password is one you can’t remember and a computer can’t easily guess. Overall the installation process was simple. Remember that if you are signed in to Chrome with your Gmail address that all of your browsers (e.g., home, work, laptop, iPad) will download and install the extension if you have that option checked in Chrome’s settings. 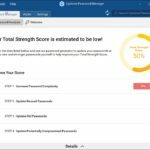 Password managers need to do at least two things really well: Store your passwords in a “vault” and secure them all with a master password. The product is well-designed and user-friendly. If you’ve used other password managers before then you’ll be up and running in no time! If not, then there isn’t much of a learning curve and they walk you through the process. We signed in to one of our websites and Cyclonis automatically recorded our login information for us. It also downloaded a logo/thumbnail of the site so that we can easily recognize it. This is similar to how other password managers record your website credentials. We also manually added a site and Cyclonis password manager recognized it when we visited that site. One feature that we didn’t expect was the requirement that you type your master password again in order to see your saved passwords in clear text. For example, after you save a new username/password and click away from the password box you can’t see it again unless you retype your master password. You can disable this feature by checking the “Always authorize” box. If you have a lot of passwords there is a search box in the top right corner to help you find what you need. The Wallet tab is where you store payment details, ID cards, multiple profiles, and encrypted notes. We didn’t add credit cards to our wallet but all of the normal features are there. It includes the cardholder name, credit card number, security number on the back, and expiration dates. It also includes fields to store the phone number and address of your credit provider in case you need to contact them in an emergency. You should be able to easily fill in your credit card details when you checkout at websites. This feature is used to store your passport, drivers license, social security number, and similar information. You can store multiples of each in case you want to keep track for multiple family members or personas (home, work, side-business, etc.). Most people have multiple personas and the profile tab is like multiple versions of yourself depending on the situation. Your home persona uses the email address that you only give to friends or family. Your work persona has your work details and will change throughout your career. You may run a side-business and want that persona and details to be separate from your others. 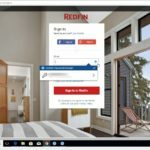 Or maybe you and your significant-other share the same computer login but need to have separate information. Each of these personas can have a different address, email account, phone number, username, etc. So when you’re signing up for a new website you can decide which persona you want to use to auto-populate the details. Private notes are general information that you want to store but doesn’t really fit in any of the other tabs. Examples would be the combination to your safe or details about your medical history. 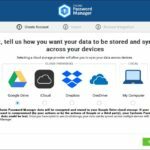 Synchronizing your password manager application to your cloud storage provider (e.g., Google Drive, Dropbox) might seem less secure but these cloud providers are much better at protecting your data. And you already trust them for some of your other sensitive data like your tax forms or financial plans. If you’re worried about your account being compromised then simply store your passwords locally. But you won’t be able to synchronize your passwords so that you can use them on your other computers. That means you may go back to creating insecure passwords or writing them down until you get home so that you can enter them. 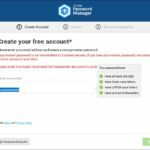 As long as you have a very long, hard to guess master password then you shouldn’t worry about someone getting access to your cloud storage file. 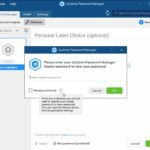 Be sure to use Cyclonis’ built-in Password Generator to change the password at your cloud storage provider so that it’s random and secure. 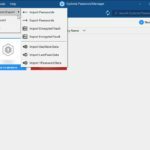 If you are currently using 1Password, Dashlane, or LastPass you can easily import your existing data to Cyclonis. If you get stuck or have questions there are lots of helpful posts on Cyclonis’ website. Or you can click the Help button in the app to perform a search on their knowledge-base. There are a lot of password managers available but many of them require annual payments for yourself and family members and store your encrypted passwords on their servers. Cyclonis is different because it allows you to use your own trusted cloud storage provider to store your data. 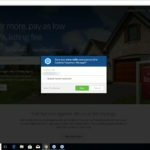 As long as you’re careful, this is a great option for people that don’t want to entrust their digital life with a smaller online company that may not have the resources or budget to ensure that your data are protected.